Our form of small business is akin to a band of jet skis shooting across the lake. The general direction is the same, but it’s more like a flock of birds than a cruise ship. And, like the birds, each person must flap their wings. On a cruise ship there is momentum enough to have some people sitting by the pool. A big company can afford specialists that clean and rearrange pool furniture. 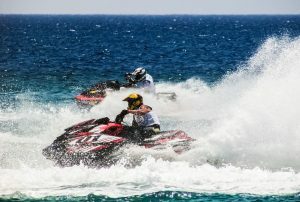 Our little jet ski companies require individuals to move between captain and deck hand tasks. An experienced cruise ship captain may not appreciate the joy of the power turn, or the importance of checking the oil of his own craft. Plus, she may not be able to gather followers without the established hierarchy of the cruise ship. A large company has a gravitational force. It’s sheer size attracts individuals more easily. People join crowds like metal shavings to a magnet. Small business is pollen cast into the wind. Their seeds scatter in a thousand directions. They occasionally take root in new soil. They become forests and prairies. They are anti-fragile. The ecosystem improves with change, whereas the big grow old, atrophy and decay.